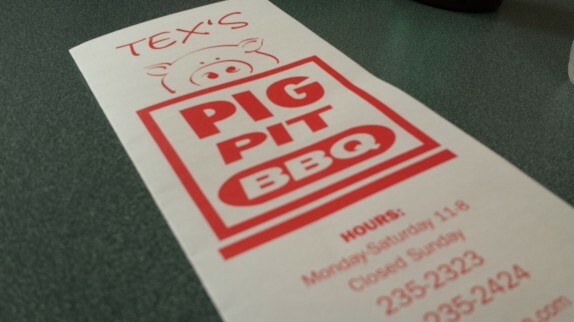 It’s been a while since I’ve stopped in to Pig Pit, so I recently found it to be a great treat when I was looking for a big meal. The menu board has so many items and customizations that it’s difficult to read from the counter, so I always pick up a menu. 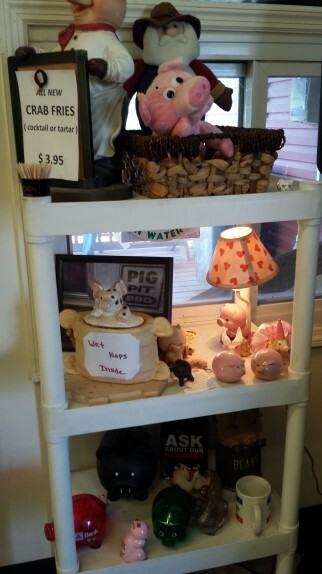 And it’s fun to see all of the pig paraphernalia they have decorating the place. 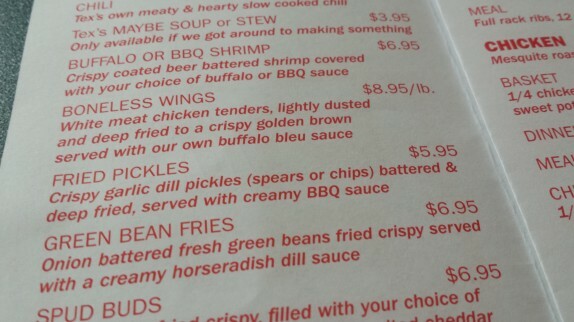 On this visit, fried pickles sounded good. I wanted the coins, but the lady at the counter said they only had spears. She also indicated that they are pretty spicy. Like that was going to deter me from ordering them! They were crispy and sour. The batter did have a touch of cayenne, which wasn’t too spicy to me, but was way too spicy for Cassie. 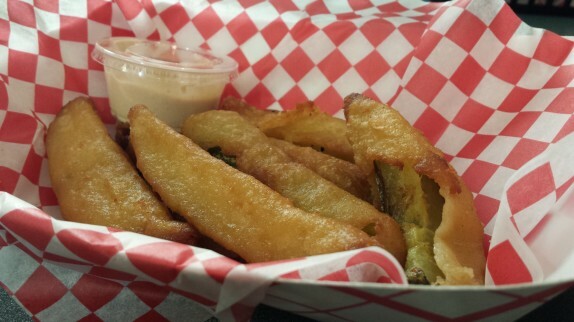 The creamy dipping sauce on the side was kind of like a spiced sour cream. I didn’t feel like it added anything to the pickles, so I didn’t use much of it. One of the best deals on their menu are the blankets, basically flour tortillas with either pulled pork (pig), pulled chicken, or sliced brisket (beef). You can make them hot (with hot sauce), cheesy, sloppy (with cole slaw), and/or stinky (with chopped onions). 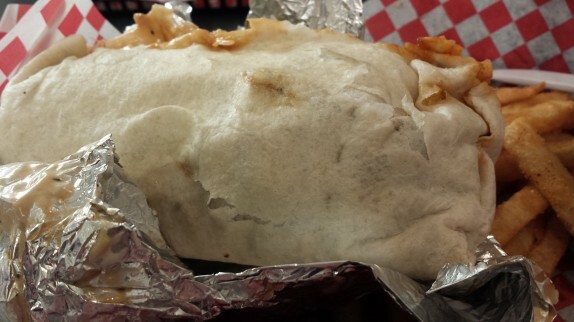 There’s a good 1/2 pound of meat stuffed into the tortilla, making the $5 price tag almost absurd, especially since the additional toppings come at no charge. 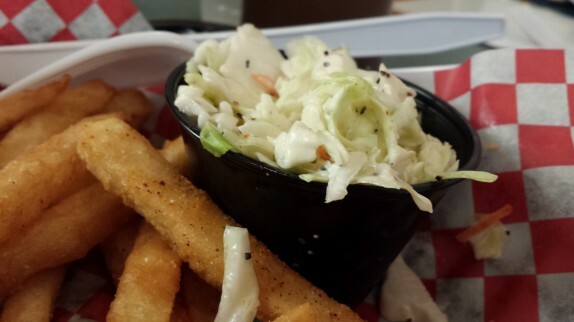 For a measly additional $2, you can make it a basket to get fries and either cole slaw or macaroni salad. I’m partial to their brisket, so I did the beef in a blanket platter, hot, cheesy, and sloppy. 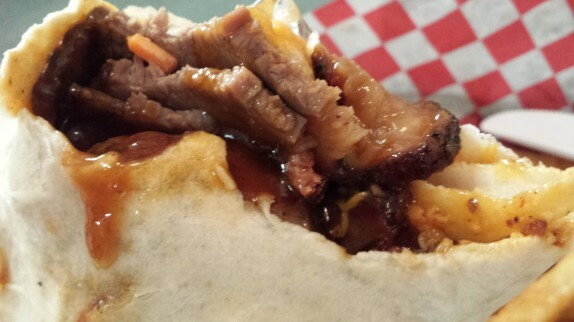 They wrap the beef in the tortilla with a little of their BBQ sauce, making their already moist and delicate brisket even more damp. 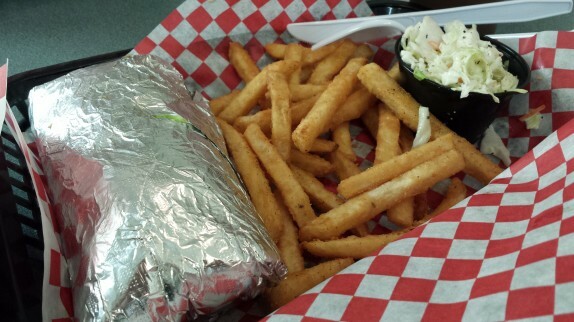 Of course, the added hot sauce and cole slaw only added to that. 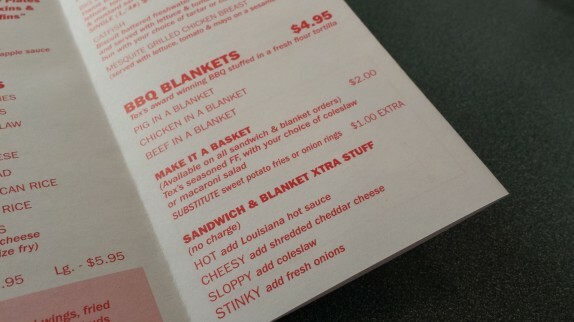 I would imagine that the blankets carry pretty well, but I’m kind of keen on biting into it and having the warm brisket and cold cole slaw and cheese melt together with each bite. On this visit, it was about 6pm on a Saturday evening, and the line was going out the door, always a great thing to see at a good place.